No 12 Easton is a little off the beaten track, although it’s not that far off the beaten track. On the eastern side of the M32 and a few minutes’ walk from Bristol’s Stapleton Road station, I was first put onto it by twitter’s Bristol Café Watcher. Occupying an interestingly-shaped corner of the High Street, No 12 is a little bit of everything: coffee shop, café, deli, grocer, off-licence and community hang-out space. If I’m honest, I had my doubts. I’m firmly in the “do a few things and do them well camp” and was worried that the coffee wouldn’t be up to much. However, I should have more faith in Café Watcher: No 12 serves some excellent coffee and, talking to owner Chris, there are aspirations to do a lot more, although perhaps not at No 12 itself. As it is, No 12 serves a standard espresso-based menu using a cast of rotating roasters. During my visit, Extract was in the hopper, the roastery literally located on the other side of the motorway. There’s a selection of loose-leaf teas (with cups for one, pots for two or more), cake, an innovative hot food menu, and well-stocked deli and grocery counters. April 2017: No 12 now has a little sibling, 25A Old Market. See what I made of it when I visited in March. No 12 Easton opened in 2014, occupying a pleasant, sunlit spot where Roman Road meets the High Street. It’s an interesting shape, roughly a rectangle, but with the corner cut off. The door is in the middle of the short side, facing onto the High Street, while the long side runs down Roman Road. Generous windows along both sides means that the uncluttered interior is bright and spacious, helped by the white-painted walls and ceiling, along with the tiled floor. The seating is around the edges, where benches run along the windows. There’s a small table to the right of the door, with two more tables along the windows to the left, a smaller one along the cut-off corner and a large, wide, eight-person communal table along the left-hand side. Two tables have been pushed together on the opposite side to form a large, 10-person communal table in front of the grocery shelves on the right-hand wall. As well as the aforementioned benches, there are also plenty of bar stools. The counter’s at the back, the kitchen behind it in a separate room. Meanwhile, tucked away at the back, to the right of the counter, is a four-person bar. I enjoyed sitting there, but the drawback is that you have your back to the entire café. No 12’s as much a deli/neighbourhood grocery store as it is a coffee shop, with two chiller cabinets forming the counter at the back. There’s an interesting array of cheeses in one, while the other holds sausages, bacon, whole chickens and the like. Also, as much as No 12’s a speciality coffee shop, it’s a neighbourhood café, serving an interesting range of hot food from the kitchen at the back, which opens from nine ‘til five each day. No 12 only has two grinders, one of which is for decaf, so rather than have house/guest roasters, it rotates the roasters on a regular basis. No 12 uses local roasters, such as Bristol’s Little & Long (who I’d not heard of before), as well as going further afield to the likes of Climpson and Sons and North Star. While I was there, the coffee was about as local as you can get, from across the M32 at Extract. I started off with Extract’s original espresso blend which was surprisingly fruity and went down very well. I paired it with a slice of cappuccino cheesecake, which was surprisingly light, fluffy and cheesy. I managed to string this out until lunchtime, so I had to try the fried egg on potato cake, which was served atop a bed of kale and mushroom. It was delicious: the egg done to perfection, the potato cake smooth and light, while the mushroom/kale mixture was a delight. There was a portion of chilli aioli, which was too hot for me, but since it was on the side, I safely navigated around it. However, it was spread over a green leaf, so on retrieving my plate, the waitress said that since I’d not eaten my greens, I couldn’t have any pudding, which was fair enough. However, I didn’t have the heart to tell her that I’d already had my pudding (insert smug face here). I paired my lunch with an excellent decaf flat white. The coffee blended well with the rich, creamy milk, but was strong enough for the taste to cut clearly through. I rounded things off with a creamy hot chocolate, the perfect end to my day. I was so impressed that I popped back the following day for lunch, consuming an excellent three-cheese toasty and its tasty side-salad. 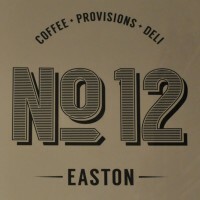 December 2016: No 12 Easton has won the 2016 Best Neighbourhood Coffee Spot Award. This entry was posted in Breakfast, Bristol, Cafes, Cake, Evening Opening, Laptop Friendly, Lunch, Produce/Food Sales, Sandwiches, Stations Nearby and tagged include by Brian Williams. Bookmark the permalink.